Get that real carrot taste with no added sugar! Home grown carrots, especially organically grown, are so much tastier than shop bought ones it's hard to tell they are the same animal. You can grow them on any reasonably workable soil, though they like deep, fertile sandy soil best. If you have stony or heavy soil you need to prepare it first. Carrots come in three main varieties: short, intermediate and long-rooted. There are also Chantenay types (I guess you would call them medium-length), and new round cultivars, useful for containers and very shallow soil. Nearly all carrots nowadays are orange, although there is a recent cultivar of mixed colours, and in fact the original carrots were cream or purple, I believe. The short-rooted and round carrots are used for early and late crops, intermediate for maincrop, Chantenay for both, and long-rooted almost exclusively for exhibition. 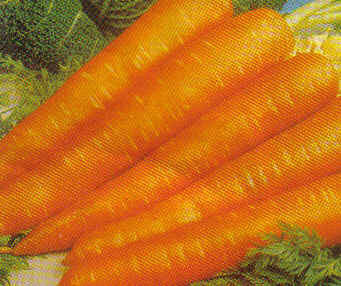 Carrots prefer sandy soil which is deep and fertile, but any reasonably workable soil is fine. Stony soil or heavy soil is not suitable for maincrop carrots unless it has been specially prepared. Do not grow carrots on land which has been manured in the previous year, or they will be fanged. Ideal pH is 6.5-7.5. Carrots are normally sown direct, as they do not transplant well unless grown in modules. They are best grown in blocks or beds to make it easier to protect them from carrot root fly. Tools list On a day when the soil is not too wet, dig it over with a fork and take out all the weeds, grass and any stones you come across. Break up the lumps of soil and try and get what gardeners call a good tilth, which is when it's broken up into crumbs of roughly even size. If the soil is poor, sprinkle on a handful of blood, fish and bone (wear gloves) per square yard/metre and mix it evenly into the soil. Rake the soil flat, then put the straight edge across the bed from one long side to the other near one end of the bed and draw out a seed drill about 12-15mm deep. Unless the soil is already wet, fill the drill with water and let it drain away before sowing. Sow the seed very finely. Carrot seed is quite reliable, so if you sow too many, you will have lots of thinning to do later. Final spacing for early carrots is 10cmx15cm (4"x6"), and for maincrops 4-5cmx15cm (1½-2"x6"). Seeds may be mixed with sand or (dry) tea leaves to aid even distribution. Cover seed and firm soil. Don't water, as this will encourage annual weeds. Put up your carrot fly fence. Keep an eye on the carrot patch until you start to see the rows of carrot leaves coming up. There will be weeds as well, but once there are a few carrots growing, you will be able to tell the weeds easily, as carrot leaves are very distinctive and the carrots will be in straight lines. Pull up all the weeds or nip them off at ground level, particularly the ones closest to the rows, taking care not to disturb your baby carrots. Firm the soil down after weeding and give the carrots their first half-strength seaweed fertiliser mixture. You will need to check, weed and feed the carrot bed twice a week until harvest. After a week or two, you will find the carrots are a bit crowded and you need to start thinning. Take great care when thinning to avoid attracting carrot fly. You can eat the thinnings. It's safest to leave the fly fence up while you are doing your thinning and weeding, but if you find it too difficult to work leaning over a fence, then put it back as soon as you have finished. Carrots will benefit from a foliar feed of seaweed extract once or twice a week during the growing season. This is particularly important on poorer soils. In dry weather water every 2-3 weeks at 15-20 litres (3-4 gallons) per square yard/metre. If you let the soil dry out completely, the carrots will split when the water levels go up again. Don't overdo it, though. Overwatering results in excessive leaves, rather than roots. Carrots may be lifted as required. If you're unused to organic produce, be prepared for a new taste sensation! For winter use, carrots may be left in the ground or lifted and stored. Precautions against slugs are advisable. In cold areas, ridge over with soil. Roots for storage can be lifted from October to December. Cut tops 1cm (½") from crown and store in clamps or boxes of moist sand. Any roots with damage from carrot fly, or diseased or twisted, should be used immediately. Stored carrots should be checked over periodically; any that are rotting should be removed or it will spread to the whole crop. Carrot fly is far and away the most serious pest (and the one that caused the problem I described on the home page when farmers went nuts with the pesticides). The best control methods do not involve the use of any pesticide at all. In order of importance. It's best to use as many of these as you can. Never leave infested roots on the ground, in sheds or on compost heaps, or you will be encouraging the carrot fly to breed. Put them in a paper or plastic bag inside a sealed dustbin, or burn them. The most effective protection is a 60cm (2') high fence, buried 5cm (2") into the soil all round the carrot bed, and covered in a material that a (tiny) carrot fly cannot get through, such as clear polythene, garden fleece or very fine net (old plain net curtains are fine; lacey ones are not). The carrot fly skims along very low to the ground. If it finds a barrier taller than about 45cm (18") it changes direction. If it cannot reach your carrots, it cannot lay its eggs, and your carrots will be free from its attentions! To reduce the amount of carrot oil that is released into the air, thin in the evening or on still, overcast or showery days and water before and afterwards. Pick up all thinnings as you go, and bury them in the compost heap, or put them in the dustbin (alternatively, if they are big enough, you could use them in a salad or just nibble them as you go). If you don't do this, the carrot fly will smell them and home in on your patch. A healthy carrot fights off attack better than a weak one. Seaweed fertiliser contains all sorts of trace minerals and micro-nutrients that will keep your carrots in the peak of health. In addition, the smell of seaweed may act as a barrier to the scent of the carrots which the carrot root flies use to home in on their prey. In the North, add ten days to these timings. Lift early carrots by early September and maincrop roots by October to cut short the carrot fly cycle and lessen next year's attacks. This will also help reduce attack by the keel slug. Traditionally, onions and carrots grown together protect each other from carrot and onion fly by masking each other's scent. However, research indicates that it takes 4 rows of onions to every 1 row of carrots to confer protection. Other ideas for intercrops include annual flowers (French marigolds, Tagetes patula, have a strong smell which is avoided by many insects), and aromatic plants like sage or thyme. See also companions and antagonists. If after all this, you are still having trouble, you could try some of the resistant varieties, such as Sytan and Flyaway. However, please remember these are not advertised as carrot fly-proof, only carrot fly-resistant! It will still be wise to use some of the other methods described here. Also remember, they have been bred for their resistance, so little things like taste may have suffered. And if you think this lot is a bit excessive, don't you believe it. In the case of carrot fly, the only defence is All Out War!